Elevator Music is the new fragrance collaboration from Off White x Byredo, first revealed on colette founder Sarah Andelman’s Instagram. 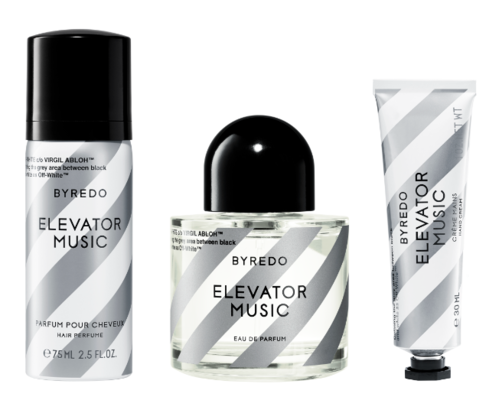 If the stripes on the bottle of the latest Byredo perfume look familiar, it won’t surprise you to learn that Byredo’s Ben Gorham collaborated with Off-White designer Virgil Abloh to create the Elevator Music capsule collection, including a fragrance, a hair mist and a hand cream with burnt amyris notes lifted by ambrette, bamboo and jasmine. Strong, graceful and perfect paired with Off-White denim or a t-shirt. The scent: burnt amyris notes make up the strong base, with the trio of ambrette, bamboo and jasmine replicating the freshness of cotton.